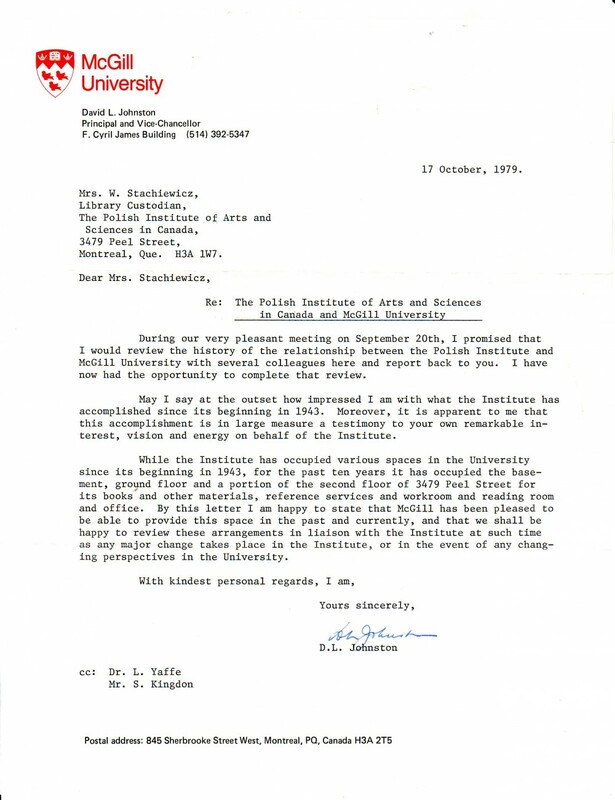 The Polish Institute of Arts and Sciences in Canada (PIASA), which has occupied 3479 Rue Peel since 1969, housing a collection of nearly 50,000 books and documents, was informed by McGill that it must move out of its building by June 1. PIASA received this verbal request from the administration on Jan. 21 of this year. The McGill Polish Students’ Association (MPSA) gathered a petition of nearly 600 signatures from members of the McGill community last week, calling upon the administration to reconsider the decision. Provost and Vice-Principal (Academic) Christopher Manfredi, cited the building’s physical condition as the reason for its closure. PIASA was conceived during the Second World War by McGill professor and historian Oskar Halecki and Wanda Stachiewicz, an eminent member of the Polish community in Quebec. 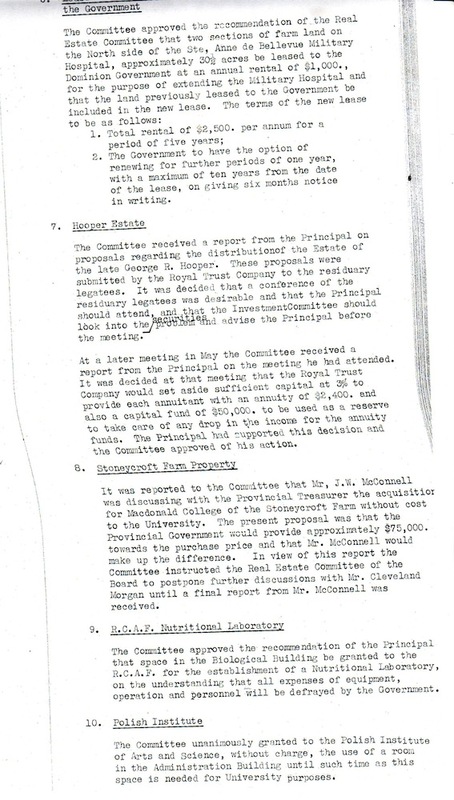 Its founding members were allocated space in the James Administration building by a motion passed through McGill’s Board of Governors (BoG), and in 1969, PIASA moved to their current location. 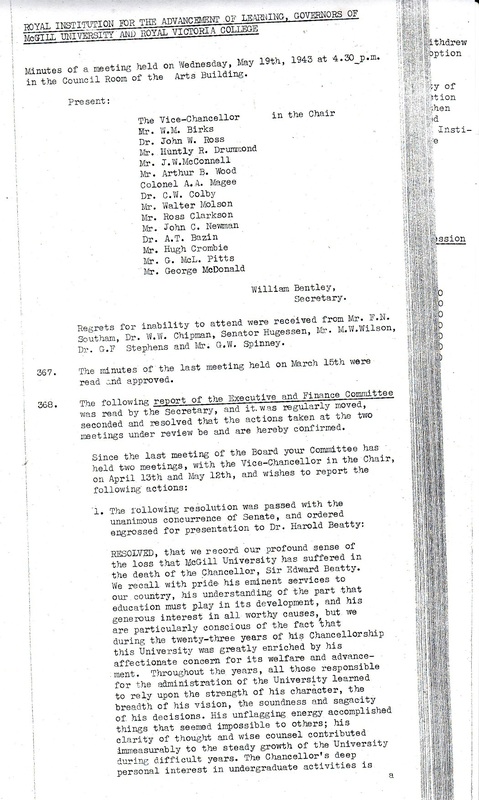 Minutes of the 1943 BoG meeting, page 1. Photo courtesy of PIASA. Since then, PIASA has hosted numerous notable Polish figures, including Czesław Miłosz, leader of the Polish Solidarity movement, Lech Wałęsa, leader of the Warsaw Ghetto Uprising, Marek Edelman, and Cardinal Karol Józef Wojtyła, who would later become Pope John Paul II.. Agnès Domanski, graduate student at McGill and volunteer at PIASA, highlighted that the institute often functions as an educational port of entry for scholarship between Canada and Poland. “The idea, essentially, behind the Institute […] is to bring Polish culture to people here, […] to the McGill community, and Montreal at large, Quebec at large,” said Domanski. Alexandre Magdzinski, MSc(A) in Nursing at McGill, and member of the MPSA, explained that a goal of the petition is to ensure that the administration is aware of the value that PIASA brings to the university. A major concern for PIASA is the fate of the Wanda Stachiewicz Polish library, which houses a collection that includes documents from the Polish government in exile, Polish literature and novels translated into French and English, and books smuggled out of Poland during the period of communism. Around 10,000 of these works are currently catalogued in McGill’s system. Minutes of the 1943 BoG meeting, page 2. Photo courtesy of PIASA. Storage of the remaining collection will be up to PIASA. Currently, PIASA does not have a plan for relocation of the Institute or the Library. PIASA is not a division of the university, nor does it have a Memorandum of Agreement (MoA) which would legally bind the institute with McGill along certain conditions. Additionally, it receives no financial support from McGill. Domanski explained the relationship they have with the university as one of a friendly, informal agreement. Letter from Principal Johnston to the PIASA, dated 1979. Photo courtesy of PIASA. The library is accessible to McGill students for free, and open to the city of Montreal through its status as a municipal library—which secures its funding through the Quebec Ministry of Culture. PIASA covers the rest of its expenses, such as the conferences it hosts, through personal donations, funding from the Polish Embassy in Ottawa, and the Ministry of Culture in Poland. Arts Senator Erin Sobat reached out to PIASA after he saw the Facebook event for the petition. He spoke with volunteers at the institute, and consulted with the third-floor occupant of the same building, the Association of Graduate Students Employed at McGill (AGSEM), which will also have to vacate. "[PIASA] doesn’t have a legal relationship with the university at all,” Sobat said. “It’s unfortunate that there’s not even a MoA […] [McGill] is required to give AGSEM a space according to their collective agreement, at minimum an office and a phone." Sobat indicated he has no specific plans yet for an official response on the decision, although there are options to do so. The petition will be submitted to McGill on April 15. Magdzinski recommends any student who wishes to vocalize an opinion to the administration to do so through contacting PIASA, or by reaching out to the MPSA.